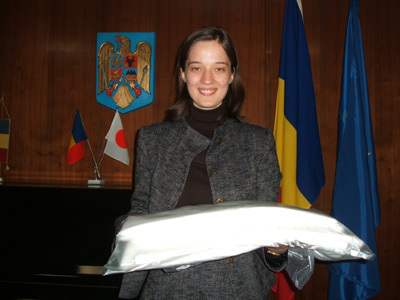 Embassy of Romania: We presented cotton sheeting for the painting. Embassy of Romania: We visited Embassy of Romania and presented cotton sheeting for the painting to Attaché Press, Culture and Education Department Ms. ANDREEA BUCNARU. Embassy of Romania： We had of meeting Attaché Press, Culture ＆ Education Department Ms. Andreea Bucnaru.